Lind Consulting Group is a unique partnership of experts working together to improve the performance of teams, especially in the healthcare industry. 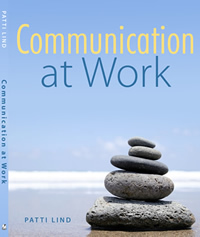 Communication at Work is a collection of short reflections written to help guide individuals through challenging situations at work and at home. Drawn from decades of experience coaching physicians, leaders and staff in the health care industry. Patti Lind provides practical, down-to-earth suggestions on how to build better relationships, reduce tensions, and talk through disagreements. The book is designed to stimulate personal reflection as well as discussions within work teams. Below are links to several articles Patti Lind has authored regarding effective communication skills and behavior. Most documents are in pdf format and you will need Adobe Reader to view the file. Patti Lind is a communication consultant in Portland, Oregon, who provides communication tips and training on communication skills. She helps businesses work with difficult people and difficult situations, helps teams improve listening skills in the business environment, and teaches conflict resolution skills as well as leadership communication skills. For communication advice and communication tips and consulting, contact Patti Lind to see how she can help improve communication in your business.